An imposing oversized boar covered from tusk-to-tail in tough armour. Undead Parish: Either of the initial entrances to the Parish from Undead Burg will lead you a courtyard. You'll find a Mecha Boar standing in the centre of it surrounded by various armoured hollows. Anor Londo: You'll meet two at different points in the hallway that connects Anor Londo to The Duke's Archives. Gore Charge: The boar paws at the ground and then rushes the player for a powerful gore attack - if it connects it will launch the player into the air. The charge covers a lot of ground and the player usually must find an obstacle or doorway to hide behind, rather than try to outrun it. Gore Thrust: If close to its front it will thrust forward a short distance and attack with its tusks - this can be blocked. Tusk Launch: If in front of it, it will attempt to lift you up with its tusks - this can be blocked. Tusk Swipe: Swings its tusks wildly to the left or right to try and hit a target at its sides - this can be blocked. Boar Kick: If the player is positioned behind the boar for too long it will kick with its hind-legs - this cannot be blocked and will knock you down. 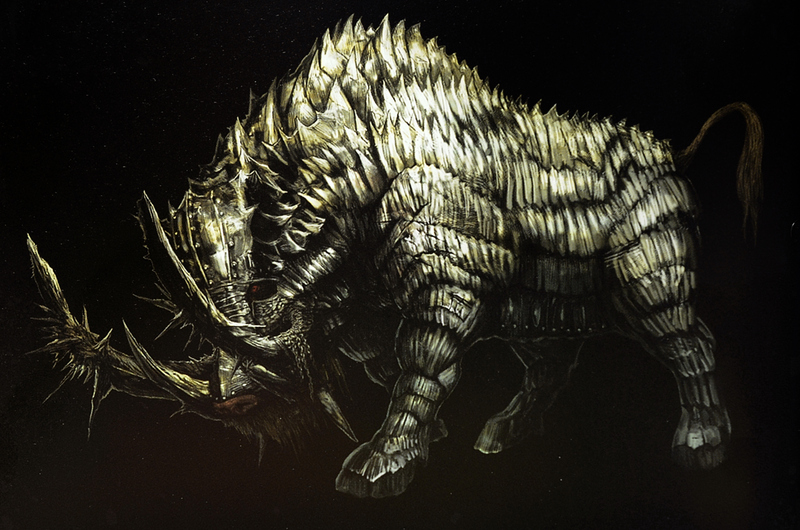 The boar's thick armor grants it an extremely high resistance to both physical attacks and spells. They are weak to lightning though. 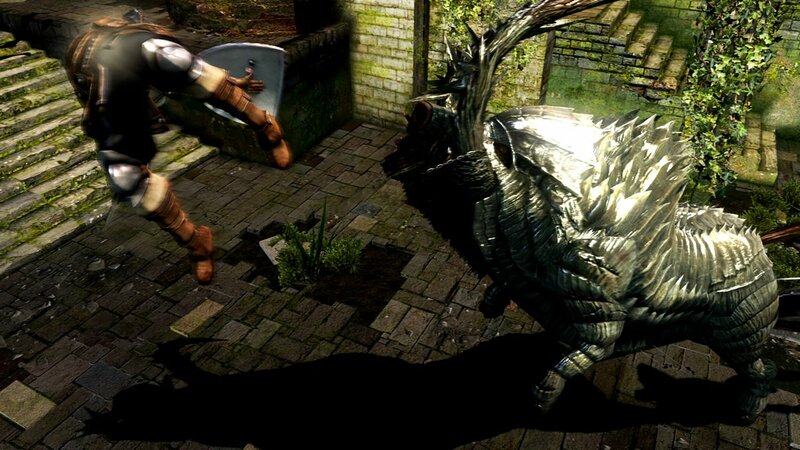 Weapons tend to rebound or deflect off the boar's armor, dealing only minimal damage and leaving a melee attacker momentarily stunned and vulnerable. Staying too close to any of its sides for too long will incite an appropriate attack that will allow the boar to hit you, so keep moving. Keep your shield up and move to its sides, closer to the hind legs ideally, and try to stay in that area to avoid getting hit. Attack only when it's not attacking and only once, as the armour it wears will stagger you when you hit it, leaving you vulnerable. The area below its nose is also vulnerable to physical attack. If you use an upward swing (e.g., 2H R1 from great-axe), the boar will take full damage. However, standing in front of the boar places you in the area of greatest risk. All versions of the Boar are susceptible to poison, be it from poison arrows, poison mist pyromancies, or poisoned throwing daggers. Poison throwing daggers may be the most efficient, as they can be used fairly safely while still holding a shield, and should poison the boar with only 2-3 hits. This Mecha Boar is armored everywhere but the rear, making its tail a viable area for a backstab. When you have rolled past or avoided the charge, quickly move to its rear and perform a Backstab attack and damage it greatly. if you spend too long behind it while attempting a Backstab it will use the Boar Kick to defend itself, so be quick and get away from its rear if your attempt is unsuccessful. Plunging attacks from the walkway where the archers were can be effective if the boar is lured close. The boar is vulnerable to fire, so throw Alluring Skulls (4 of which are located on the walkway presumably for this purpose) onto the pile of burning corpses from the walkway; the boar will roast itself. If the boar is too far away it will not react to the Alluring Skull, so it is most efficient to wait until it is back to its starting position close to the walkway before throwing the skull down. Firebombs can also be thrown from the walkway down onto the boar. The boar is similarly vulnerable to other fireball type pyromancies cast from the walkway. The boar acquires targets at a fairly long range (with an exception of anyone up on the walkway whom it usually ignores). This can be exploited by walking a bit towards the boar from the front to trigger its charge windup (it usually begins pawing the ground), and then moving quickly to your right towards the base of the stairs that lead up to the walkway with the archers. While you still need to be careful as the boar can fit its head between the columns, usually it charges and gets hung up between the columns or even stuck in the fire. You can then hit it with firebombs or pyromancies in relative safety as it stands there or slowly backs up again, or have any summoned allies attack it from behind while it concentrates on you. It is helpful to clear the Hollow soldiers first before trying this. Another easy attack method is to first clear the area and then drop off the walkway, where the two crossbow enemies were, and lure the boar down the stairs. He can only fit half-way down and will begin to turn around to return to his standard position, so you should simply attack his back then retreat down the stairs when he turns to face you. Repeat until the boar dies. Another strategy is to walk back towards the bonfire when you have him focused on you. If you go past the archway before the area with the boar he will turn around and go back once he passes it, allowing you to attack him once or twice before running back. You can repeat this as many times as you need to kill it. Note that the boar can and will charge much further than the archway, it will not however attempt any attacks after this, it will just turn around and go back until you strike it again. If you can cause the boar to charge into one of the fires it will inflict a large amount of damage. If the gate behind the boar closes on top of the boar, it will kill the boar instantly. The two boars in the hall leading to The Duke's Archive appear to have fully armored rears - unlike the boar in the Parish - making backstabs ineffective. They also have much higher hitpoint totals. There's two in the hallway, but they're not right beside each other. So ensure you don't go too far in and aggro both of them simultaneously - deal with them one at a time. The first is visible from a long distance at the far end of the hallway, and ranged attacks can work well. They may be poisoned by poison arrows. The boar can charge the length of the hallway towards you, but cannot usually pass the threshold of where the hallway starts. Even if it does, it will either turn away and head back to its starting position, or do so by backing up while facing towards you. That can be an opportunity to use spells or melee attacks. It is also possible to fight the boar in the hallway itself, if you stay to its sides and attack as outlined in the General Strategy section. The second boar is found around a corner farther down the hallway. Because of its location, it is more difficult to defeat with arrows or line of sight spells. You may still do so if you use the edge of the corner for protection, but expect the boar to figure it out and charge around to get you. It is possible, albeit risky, to evade both boars and enter the room beyond them containing the bonfire and the elevator. They will usually attempt to follow but get hung up in the doorway, allowing for ranged or spell attacks with relative safety. If they do manage to enter the room, standing to one side of the elevator up on the raised area will provide a safe spot to continue to attack them. A poison mist pyromancy attack can be effective particularly on the second boar, as the AoE spell can be directed around the corner to poison the boar without aggroing it. Lightning weapons obtained from the Giant Blacksmith in Anor Londo can help. The lightning damage will affect the boar even if your weapon does little physical damage and rebounds from the boar's armor. And since the boars are weak to lightning, one of the easiest way to kill them is by using any version of Lightning Spear.